It may still be Winter, but Spring is not that far off the horizon. Heck, today is Groundhog Day so perhaps the little furry fellas will scramble outside and predict blue skies and warm breezes in our near future. Well, a girl can hope! In the meantime, why not get set for all the joys that Spring brings - even showers! Rain in the Spring is so much easier to tolerate when you have a fun umbrella to keep you dry and smiling. Raining cats and dogs? We've got you covered! 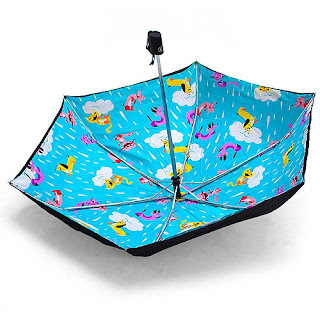 The giddy gang at Gama-Go offer this pet friendly umbrella. Cute but subtle as the print is on the inside. Genius!